College students are vulnerable to consistent high levels of stress and anxiety due to adjusting to a new environment, academic pressure, and uncertain future careers. Even though there are many mental health related programs on campus, we have witnessed several tragic events that indicate the seriousness of this problem. Up & Up is a project created to promote collective breathing among students. College students are constantly stressed. Yet not a lot of them know the proper way to deal with their stress levels. Breathing has long been known for its effectiveness as a stress intervention technique, but it has not been widely adopted nor practiced by a large number of people under stress. Hoping to encourage students to learn more and adopt such an effective stress intervention technique, our project team created Up & Up - a mobile game which encourages users to dismiss the representation of their source of stress with peer support by pumping and flying balloons together. All team members participated in this project as UX researchers and designers and we equally contribute to the whole process of this project. I particularly enjoyed the preliminary research part because I have a basic understanding of the problem space due to my ongoing master’s project which also addresses student mental health problems. We decided to focus on stress because of stress’ widespread influence on people’s everyday lives, especially students. According to the Statistic Brain Research Institute (2017), over 70% of Americans regularly experience physical/psychological symptoms caused by stress. Among people of all age groups, young adults (between 18-33) reported the highest average level of stress (American Psychological Association, 2013), making this group a valuable target user group for intervention. Our team members personally know college students who suffer from high stress levels, which even lead to depression and suicidal thoughts. In less extreme cases, stress still makes it difficult for people to manage their work, causes them to fight with people close to them, and sometimes alienates them from their friends or family members. As our team conducted more research to understand stress, we came to an understanding that stress is a very broad topic. The problem area of stress involves a number of big topics, including data collection and various intervention techniques. We realized we had to narrow down our project scope to something more specific. After some discussion with the class and Dr. Wilcox, we decided to focus on breathing - a stress intervention technique which has already been proven effective - and transform that into a collective breathing solution. Potentially the collective breathing experience could turn out as a crowdsourced display or a collective breathing game experience. By encouraging collective breathing on campus, we believe we will not only be able to help individuals who join the collective breathing exercise lower their stress levels but also draw attention from students to the need to take a moment to pause and practice some useful stress intervention techniques. Peer support has been identified as an important factor to encourage individuals to participate as well as a factor to draw attention from the community. Therefore, we decided to not just focus on individuals in our design. Hoping to understand what makes a collective/community based design effective to promote change within a student population, our team conducted another competitive analysis on some existing collective/community based designs. These solutions are not necessarily breathing/stress related, yet they have all involved multiple participants and formed connections/communities with their designs focusing on mental health or fitness. We reviewed relevant studies whose focus is designing technology to encourage people to practice breathing techniques. Many researchers explored the opportunities of using breathing as input in a system (i.e., using breathing to control amusement park rides, using breathing to scroll pages in web browsers). Among those systems, we focused on the digital artifacts which aim to address stress and anxiety problems through breathing exercises. From the studies, we are better able to understand the challenges and opportunities in designing technology for breathing exercises. To learn more about our target users (college students), we conducted 4 semi-structured interviews to learn about students’ current stress levels, their sources of stress, how they currently deal with stress, and what they love doing in their free time. Based on the interview data, we created two persona representing our user groups to better guide our design. Our findings confirm that motivating students to do breathing exercises can be one way to help them relieve their stress. Students will probably be willing to participate in breathing exercises if prompted correctly, because most of them have heard about the effectiveness of these exercises and have a positive association with them. After settling down on our idea of creating a collective breathing intervention for college students, our team sat down and conducted a design thinking workshop to generate ideas. We first reviewed the design inspirations gathered and personas created based on our research in P2. Then all the group members were given 2 sessions (10 minutes each) to sketch out as many ideas as possible on Post-it notes. We then each presented our ideas, and grouped similar ideas on the whiteboard. Creating an immersive breathing experience in a public space using different modalities (audio, visual, etc.). Designing a smartphone application that enables students to do breathing exercises together. Designing a VR/AR game that encourages students to breathe together. 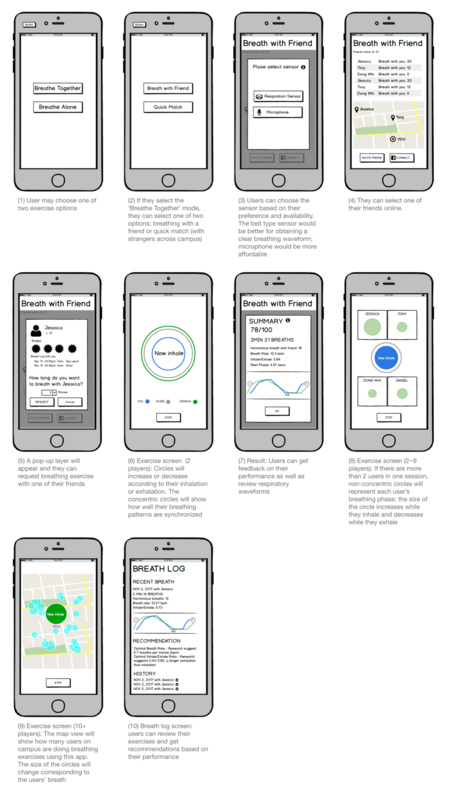 This is a collective breathing exercise app which enables users to breathe together with their friends or students across campus. The purpose of this app is teaching users breathing techniques which can be helpful to relieve their stress/anxiety as well as enhance a sense of togetherness by breathing in similar rates/pattern with others. For this idea, users may be able to choose one of two options; a belt type sensor or a microphone (in their smartphones). This is a collective, immersive experience that aims to let people (20 max) breathe together in a relaxing environment. Students are able to enter the pitch dark room and sit on futons, which have pressure sensors and can recognize when a student is sitting on them. After the students put on their breathing sensor (a belt) around their torso, they will be able to see their breaths visualized in waveform on a large display screen, which is mostly dark except for the breathing patterns. Students will hear the relaxing sounds of ocean waves, which also serve as an audio cue to let them know when they should inhale and exhale. In addition, there will hear soothing background music, which is composed of a progression of simple music chords. The chords will become richer and richer as more people sit down and start to breathe; each person will contribute to part of the chord, so that the experience becomes even more immersive and relaxing as more people join. This is a mobile game that focuses on getting people to practice breathing and relax together. This game turns tests/quizzes, the representation of student stress, into kites, a delightful and relaxing element. Then it utilizes a user’s breathing pattern input from sensors, such as a flexible band sensor, for accurate detection, or the microphone of a smartphone, for convenience, as a way for users to control the kites flying in the sky. In order to decide on one idea to develop further, we conducted user testing with potential users. We recruited six participants using convenient sampling. All of them are graduate students at Georgia Tech; four of them were female. Every session was an individual interview and one of our team members attended and led the sessions (every member conducted two sessions). Every participant tested all three ideas. We used low-fidelity prototypes during the sessions. For idea 1 and idea 3, we created InVision prototypes which can be explored through smartphones by participants. For the second idea, we used a storyboard to explain the concept of the room and how they will interact with this solution. While they walk through the storyboard, we played ambient background music to help them to understand the atmosphere of the room. We also showed an animated visualization sample from YouTube as a reference. A number of our participants mentioned the importance of convenience. They want to be able to practice breathing whenever they feel stressed. While solution 2 is unique by setting up an immersive space on campus, it is clearly not as convenient as solution 3 which is a mobile game that anyone can open up with the app whenever they feel like it. Solution 2 requires users to be in an actual physical space on campus. Moreover, participants raised concerns about the room being fully occupied when they need a space to relax. Therefore, solution 3 is definitely a more convenient solution for our users. Solution 2 has a more abstract form for the visualization of breath which shows the movement of waves; while solution 3 visualizes the breathing result with a kite. Some participants indicated that it is easy to understand the visualization with a kite, and see the impact of their breathing better. Feasibility While a number of participants mentioned they like the idea of having a room/installation on campus, they are also not sure about how feasible that would be (that GT will be able to provide a space to do so). A kite flying app is definitely more appealing in terms of feasibility. We conducted the initial user evaluation during a class with classmates. They are our target users because we are planning to address college student stress problems. Four students participated in the testing, three female and one male, all in their mid-twenties, who were masters students in either computer science or human-computer interaction. Each session involved about twenty minutes of individual testing with one facilitator and one note-taker. We videotaped the sessions to create a promotional video for this project, but only the notes from the tests were used in analysis. At the beginning of each session, we explained the purpose of this project and gathered demographic information from the participants and asked their perceived stress level on a scale of one to seven. They were asked to perform three tasks step-by-step. The first task was selecting ‘Job-seeking’ as a source of stress and electing to use a microphone as a sensor in the on-boarding screens. The second task was finding other players who might be interested in playing the game with them (either their friends or strangers in GT). The last task was playing the game and using rewards to customize their balloon. After the tasks, we asked questions to collect their feedback including Likert-scale questions and open-ended questions. The survey-style questions included information like how often they would like to use this app in the future, how the solution is effective in relieving their stress, how likely they are to recommend this solution to their friends, and System Usability Scale (SUS) questions. For open-ended questions, we asked about their favorite part of the game, their least favorite part, and potential areas of improvement. Several participants mentioned that the solution is only effective when people remember to use it and engage with it in the long term. In order to achieve that, we must make the game appealing enough for people to come back, and remind them from time to time to engage with the app. One way of making the game more appealing is to create a better reward system. Right now, participants can customize their balloons based on the points they earn from previous games. Based on user feedback, this is definitely an attractive feature. However, compared to other games in the market, the reward system is still not engaging enough. In our future design, we’d like to experiment with different breathing patterns and gameplay modes users can unlock as they earn more points. Potentially, we can provide users with animations related to breathing but different from flying balloons, or more interesting ways to interact with friends through breathing. We will try to constantly provide users with more interesting features as they level up, so that they are motivated to earn more points and explore those features. Since our application is social by nature, we might consider adding more incentives for users to play it by enabling them to share their results and achievements either publicly in a news feed within the app, or on popular social media. We will study systems that have social features like Venmo or Keep (a physical training application that allows users to share their achievements on social media) to inform our design. Existing breathing apps, like Apple Watch’s Breathe, push notifications to users to remind them to perform breathing exercises several times a day. One user in our study indicated that she would need such notifications because she might forget to do those exercises if she was not reminded. Though we’d like to encourage our users to use our app more often, we also don’t want them to regard using our application as a task that needs to be done. Therefore, we might consider adding notifications in our next version, and test it with a variety of users to see if they like it and benefit from it.